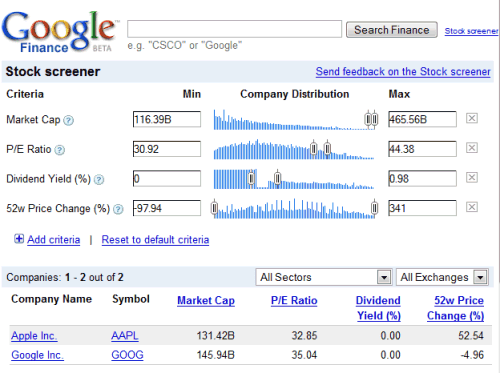 Find the perfect stocks for your portfolio with the new stock screener from Google Finance. You can use criteria like: market capitalization, the P/E ratio, the most recently reported trade price, gross margin and select the values interactively. Brain Lint notes that Google uses sparklines, "miniature graphs that go inline with text. In this case the graph is a histogram that indicates how much of the stock market falls into each part of the range - this will give one a quick preview how inclusive their search parameters are." It looks much better than the stock screener from Yahoo Finance, which is anything but intuitive. Even if it looks outdated, Yahoo Finance has more features and content, so its user base won't migrate to Google Finance for the vivid charts and the clever integration of news headlines. I liked this feature when thinkorswim offered it years ago, it makes it easier to find the stocks that you might be interested in trading. Though the thinkorswim features live streaming quotes. I guess google can't do everything at once. Some of the best screeners out there look pretty crummy. I'm Canadian so GlobeInvestor.com is my primary source of tools. They're nowhere close to Google in prettiness but they're way ahead for functionality and completeness of information. Google needs to partner with sites that have the reputation and traffic already. Let those sites provide the data while Google organizes it for them! Is there a way to download this data to excel? After I apply metrics to screen stocks based on my requirements, I would like the option to download this data to excel so I can run data analysis tools. Hi there, have you found a screener to export to excel for data analysis? if so, can you please email me a link at duncanjones2002@Hotmail.com, thanks to whoever posted this very much. The interface is nice and very easy to use. As some of you who want to screen on the historical data, here is another stock screener you may interested in. I'm still trying to find a way of having the Google Screener AUTOMATICALLY filter companies priced above their 20, 50, & 200 day moving average?? The only way I see is looking at the price myself and looking at their 20, 50, & 200 day prices. the ability to export (for further analysis) is kinda critical - without it it's kinda like only window shopping. to anyone looking for solutions to trouble exporting to excel, try copying and pasting all table related information that the googlefinance screener gives you. Seems to be sufficient for analysis.